"The population [in Yemen] is exhausted by the lengthy conflict and a great many children are suffering from hunger, but cannot access food depots," the Pope said. Some have been queuing for passes for Tuesday's Mass. One told AFP news agency the Pope's visit "opens doors for conversations about tolerance that the whole world needs to hear". In a video message on Thursday, the Pope said: "Faith in God unites and does not divide, it draws us closer despite differences, it distances us from hostilities and aversion." 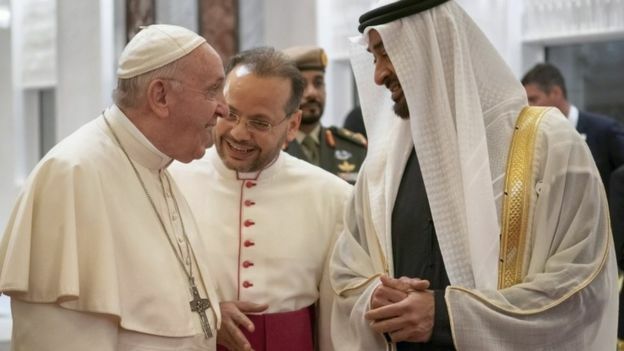 BBC Arabic's Murad Batal Shishani, who is in Abu Dhabi, says the Vatican hopes that the Pope's visit might loosen restrictions on the building of churches in the region, particularly in neighbouring Saudi Arabia where non-Muslim places of worship are forbidden. "We are really stretched. We need more churches. We need more priests," one official was quoted by Reuters as saying.